He arrived at Jokhang Temple at 5:26 a.m., greeted by lamas lining up at the temple gates holding Tibetan incense and Buddhist prayer flags. The Panchen Lama visited the major halls of the temple, bowed in salute three times and presented a hada, a long, scarf-like white silk used by Tibetans for blessings, to a statue of Buddha Sakyamuni. According to historical records, the statue of Buddha Sakyamuni was brought to the temple by Princess Wencheng of the Tang Dynasty in the seventh century. The Panchen Lama then led sutra chanting at the temple, praying for peace, prosperity, and stability, with over 100 monks from the Jokhang Temple and Tashilhunpo Monastery. 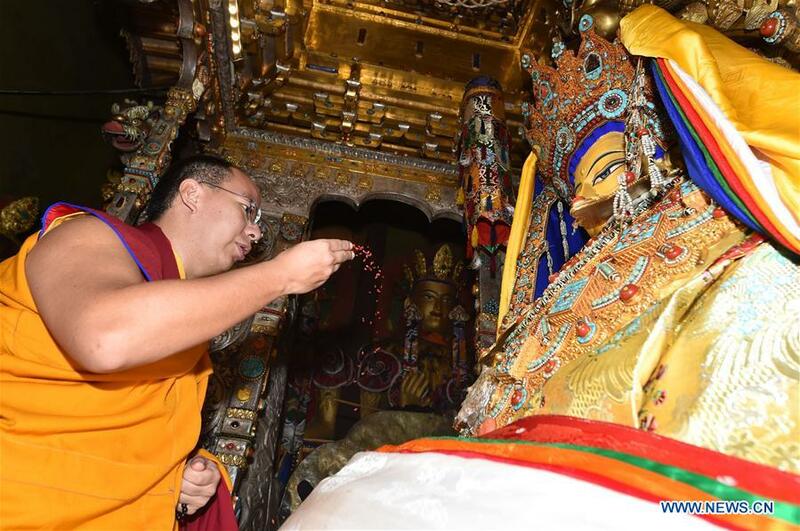 At about 6 a.m., the Panchen Lama performed a head-touching ritual to bless the lamas.